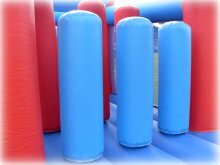 No longer do the adults have to sit and watch the kids have all the fun with our Inflatable Assault Courses for adults. We have our Big Challenge Adult Assault Courses available in three sizes: 70ft, 95ft, and 120ft - and if that's not long enough for you we can add a pair of run over flip walls as well! 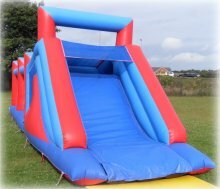 The participants race through the inflatable assault course in pairs through all the various obstacles with the first to the end the winner - this can be done with either individuals or teams competing against each other making it perfect for team building events and company sports days. 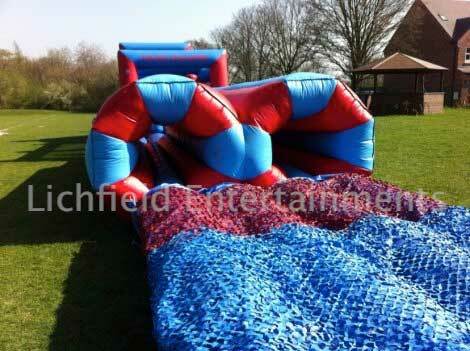 The assault courses include scramble nets, tunnels, ramps, biff bash tubes, mangle bars, cargo nets and slides. 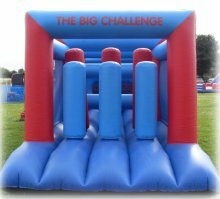 Below is pictured the 95ft version of the Big Challenge inflatable obstacle course. Our adult assault courses come complete with a trained member of staff to ensure everything runs smoothly. If required our staff member will arrange races, keep times, etc. A mains electric supply will be required within 50metres but we can supply generators or petrol engined blowers if this isn't available. 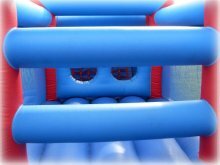 The 70ft assault course requires an overall operating area of 80x16ft, the 95ft version requires 110x16ft, and the 120ft version needs 130x20ft. Our assault courses are all BS EN14960 compliant, covered by liability insurance, and both a risk assessment and method statement are available for confirmed hires. Alfreton, Ashbourne, Bakewell, Balsall Common, Banbury, Beaudesert, Bedworth, Bicester, Birmingham, Bridgnorth, Bromsgrove, Burton upon Trent, Buxton, Castle Donington, Cheadle, Cheltenham, Cheshire, Chesterfield, Cotswolds, Coventry, Crewe, Derby, Derbyshire, East Midlands, Gloucester, Gloucestershire, Grantham, Greater London, Hinckley, Kenilworth, Leamington Spa, Leicester, Leicestershire, Lichfield, Lincolnshire, London, Loughborough, Lutterworth, Macclesfield, Malvern, Mansfield, Market Drayton, Matlock, Melton Mowbray, Meriden, Milton Keynes, Newark, Newcastle under lyme, Northampton, Northants, Nottingham, Nottinghamshire, Notts, Oswestry, Oxford, Oxfordshire, Redditch, Rugby, Sheffield, Shrewsbury, Shropshire, Shrops, Solihull, South Yorkshire, St Georges Park, Stafford, Staffordshire, Staffs, Stoke on Trent, Stratford Upon Avon, Sutton Coldfield, Swadlincote, Telford, Uttoxeter, Warwick, Warwickshire, West Midlands, Worcester, Worcestershire. Some areas will be subject to a delivery charge or minimum order requirement.